Frances Mayes' Bramasole Extra Virgin Olive Oil. All photography except where noted is property of EuroTravelogue™. Unauthorized use is prohibited. If you know me, you know how much I love Tuscany with its golden hills of olive groves and vineyards punctuated by picturesque Tuscan villas and charming hilltop towns that await around every turn in the road. 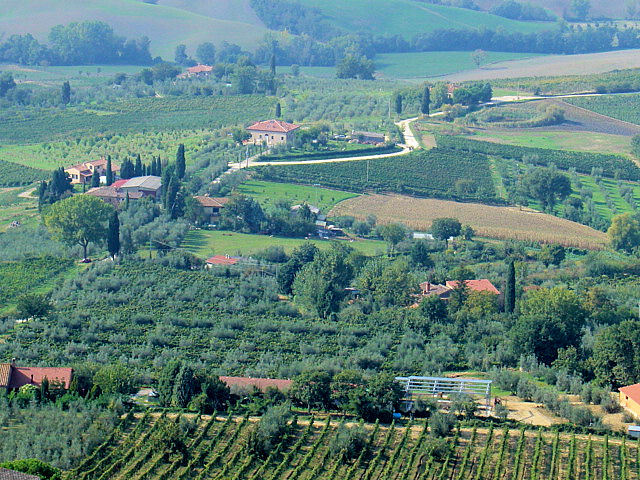 Despite my many visits to Tuscany, I have yet to stop at one of the vineyards or olive groves ripe with sun-drenched grapes and hearty fresh olives for a tour and tasting. Until such time comes, I must settle for imported wines and olive oils that bring those sweet tastes of Tuscany to life for me back home. With that said, I bring to you an olive-oil tasting that has changed forever the way I think about this elixir of life—a savory oil so full of the flavors of Tuscany. 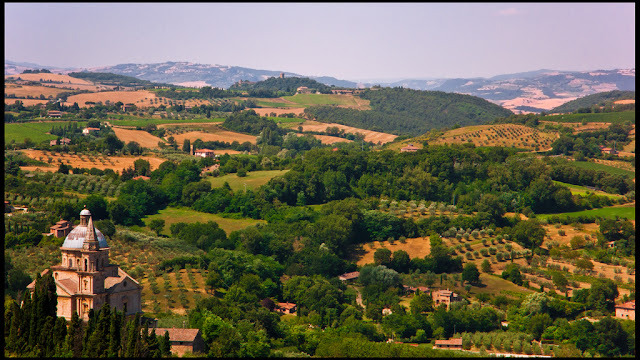 The sublime Tuscan countryside as seen from Montepulciano with fields of olive groves and vineyards. I've never really given much thought about olive oil other than the fact that it had to be extra-virgin or EVOO and imported from Italy and Spain mainly, and most importantly not a bargain brand on the shelf that could last until the next millennium. All of that changed when I received a small package of Frances Mayes' Bramasole EVOO, a small can plus a bottle from the year prior. Fresh from this year's harvest in October, the small can of Bramasole Extra Virgin Olive Oil, whose name comes from Frances Mayes' historic and now very famous farmhouse in Tuscany, was the greenest oil I've ever seen and tasted. I couldn't wait to pour it liberally onto a plate, add my favorite dipping spices and then soak up my toasted bread like a sponge. And so I did! It was sublime and pardon the cliché, love at first bite! The rich and fruity flavor of the fresh picked olives burst inside my mouth and sent my taste buds reeling! I couldn't wait to use it for cooking and in my salads as well! The only other time I remember an olive oil tasting this good was when I was in Venice at a small café in Castello, and that became the standard for all oils since. Until now. 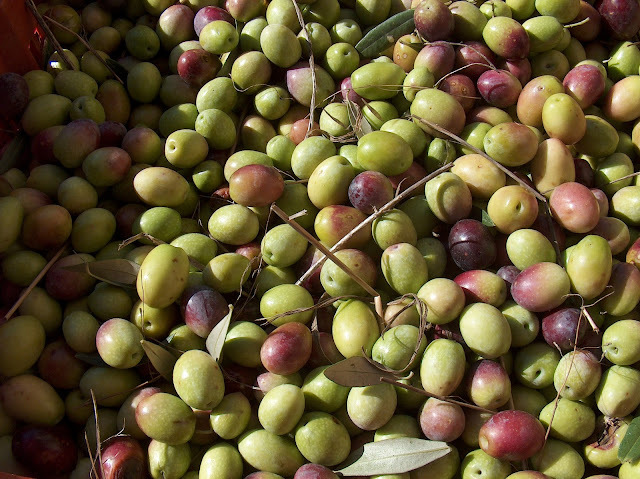 Fresh from the harvest, these olives are destined to become a most savory oil. Photo: Giancarlo Dess, WikiMedia.org. 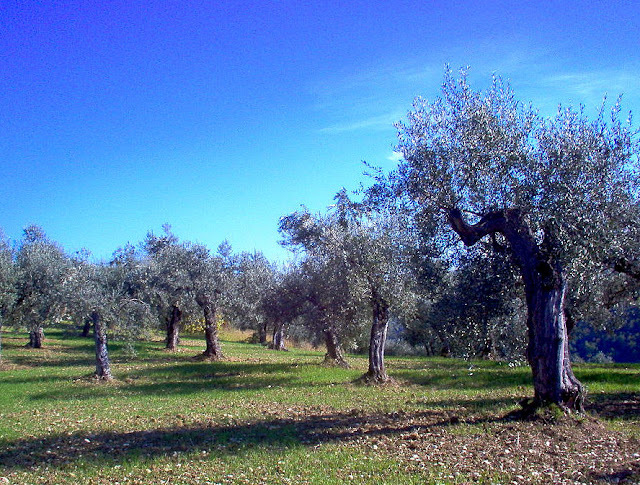 Olive grove in Tuscany. Photo: Alessandro Antonelli. After my initial tasting though, I had the most unexpected and peculiar reaction to the oil—a slight choking in the back of my throat which made me cough—but don't worry, after a little research, I found this to be a most welcomed reaction due to the oil's freshness. "How wonderful" I thought. Let me share a couple of paragraphs from an article I read that describes in more detail this reaction and its causes. I also learned a lot about the not-so-delicate side of olive oil: the bitterness, the drying astringency and especially that peppery pungency that hits the back of the throat and provokes a cough. Some oils were so strong that they seemed more medicinal than delicious. But the Italian and Spanish judges consistently rated the most peppery, throat-catching oils at the top, nodding in admiration even as they gasped for breath. The sensations of bitterness, astringency and pungency are caused by members of the phenolic family of chemicals. Phenols also have antioxidant properties and so help to protect the oil from going rancid. Whenever you taste an especially peppery oil, it’s an indication that the oil is rich in olive extracts and relatively fresh. To read entire article, visit TheTuscanSun.com/AboutTheOil. Sublime Tuscan countryside replete with rolling hills of olive groves and vineyards, dotted by villas and this church. Photo: Guillen Perez. Following my sublime introduction to this fine oil, I couldn’t wait to drizzle on my bruschetta and even more so, use in my favorite dish—linguine or angel hair pasta with shrimp and garlic. As you can probably imagine, the meals were scrumptious and the fresh oil makes all the difference in the world! My mouth is watering just typing this. So how does the olive go from tree to bottle? Thanks to some notes from Frances and Ed plus a little research online, I learned a lot about the cold-press technique employed for Bramasole EVOO. A variety of olives are mixed together to produce the savory extra virgin olive oil. Photo: Rainer Deml, WikiMedia.org. Let's take a closer look into how the oil is made. Of course we need to start with the raw ingredients—hand-picked olives from Tuscany, specifically, Frantoio, Moraiolo and Leccino olives from the Mayes' groves at Bramasole (Frances and Ed have been hand picking olives for more than 20 years) as well as the groves from the mill owner near Cortona. 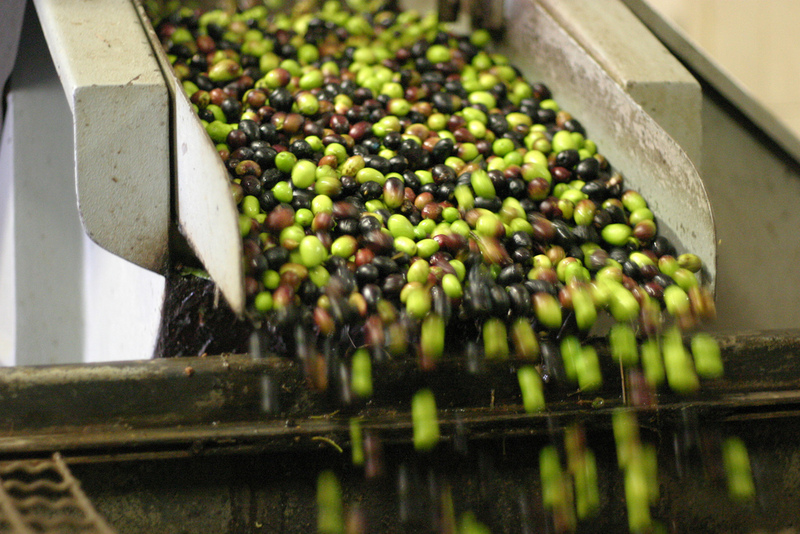 Just washed, the olives roll off the conveyor and into the hopper where they will be ground into paste, pits and all. Photo: Chris P.
After the harvest, the olives are processed through a series of hoppers and baths until all of the residue (branches, rocks, leaves, etc.) are removed. Then, the olives, with pits, are crushed into a paste and then either processed by centuries-old methods whereby the paste is placed between straw mats and crushed, or by more modern techniques employing a horizontal centrifuge to separate the water, residue and the finest EVOO. At the end, the elixir of life finally emerges from the pipes and is bottled or stored in giant vats. It is important to know that during the cold-press process, without heat or chemicals, the temperature of the olive paste can never exceed 27 C or 85 F for it to be labeled as cold press extra virgin olive oil. And, it is extremely important to pick the olives soon after ripening and then press quickly thereafter to avoid increased acidity which results from last-in-the-season harvesting or allowing the olives to sit for extended periods of time between harvest and press. Here are two short videos, the first shows the traditional method of pressing olives that dates back to the 17th century while the second shows modern production at a mill in California. Of course this process does come at a cost but worth every cent if you enjoy the freshest and fruitiest olive oil like I do. Your palate will thank you too! 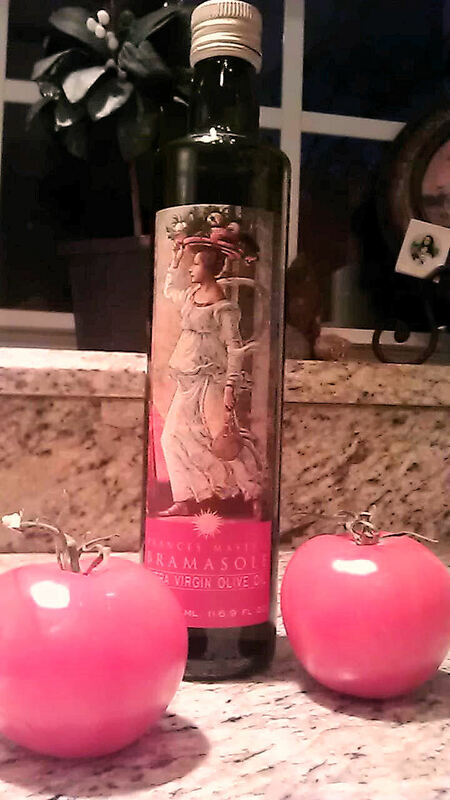 If you want to find out more about Bramasole EVOO or better yet, purchase your own case, check out TheTuscanSun.com for all the details. Like I said, the Bramasole oil does come at a price but if you gather up your friends and family to pitch in on a case, the cost is easier to digest, pun intended. To order, you will need to join the Bramasole Convivium. According to Ed Mayes, on average, Italians consume 15 liters of olive oil per person per year or 1/4 liter per week, while Americans consume only 1/2 liter in an ENTIRE year. Not me. Hilltop town of Pienza—Small on Size, Big on Charm! Great photos! I went on a tour in Southern France this summer, and it also changed how I thought about olive oil. Did you get to sample? HI there Margaret and thank you so much for stopping by to share your experiences. The south of France must have been wonderful! I did get a sample of this year's harvest but only a small teaser can...finished that off in 3 days. LOL. The bottle above is from last year's harvest and my case, yep 12 bottles of this fabulous oil from this year's harvest (OCT 12) is on its way! Much more to come from this new born olive oil aficionado. Love olives and olive oil. 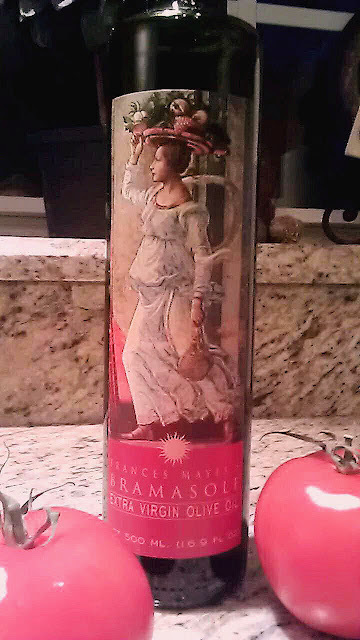 I brought back some from Spain last year, and savoring every drop! Hi there Nancie and I love Spanish olive oil as well. Never had a fresh-from-the-harvest batch but I bet every drop is sublime! Thank you so much for stopping by to share your thoughts! We just followed each other on Twitter so I thought I'd check out your website. Love this comprehensive post all about lovely olive oil. In 2010 when Conrad and I were toodling around Europe, we came across an opportunity we couldn't pass up. For 3 days work harvesting olives, we got 7 more days free lodging in a beautifully appointed apartment in the grove owner's home. We had lots of fun, (it really was! 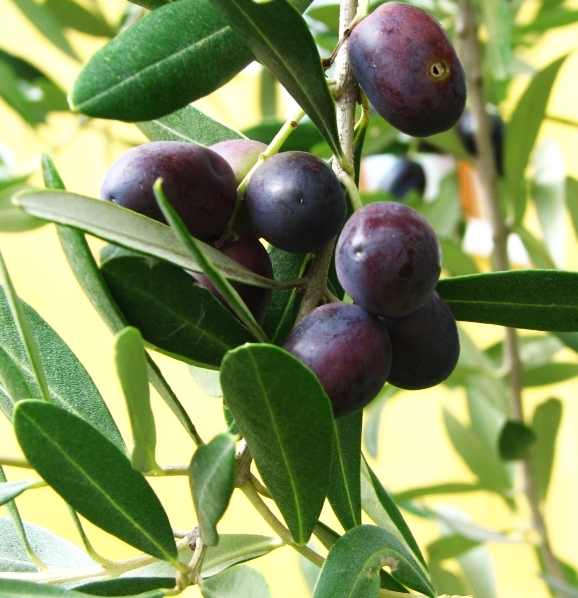 ), "combing" the olives off each of the 200 trees. The homeowners -- a lovely couple -- worked with us and we bonded over those rolling Tuscan hills and a persnickety tractor! We spent our free time exploring Florence and Sienna. Mighty fine time, we had. Wow! 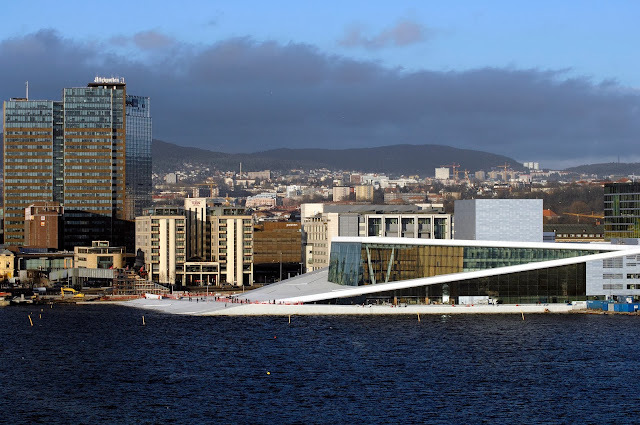 An experience you cannot buy! How absolutely wonderful my new friend! I would give anything to have had an opportunity like this...to harvest with the locals and live with them for a week! Very jealous indeed. And, I love the picture by the way! 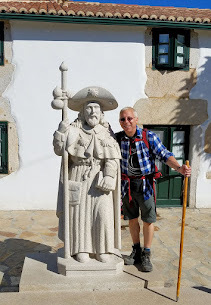 Thank you so very much for stopping by and sharing an extraordinary experience with my readers! These are the kinds of comments I LOVE to receive! So interesting! I had no idea about the reaction one might get to the fresh olive oil so that's good to know. I love seeing how things are made so I would love to experience this firsthand. Thanks for sharing! 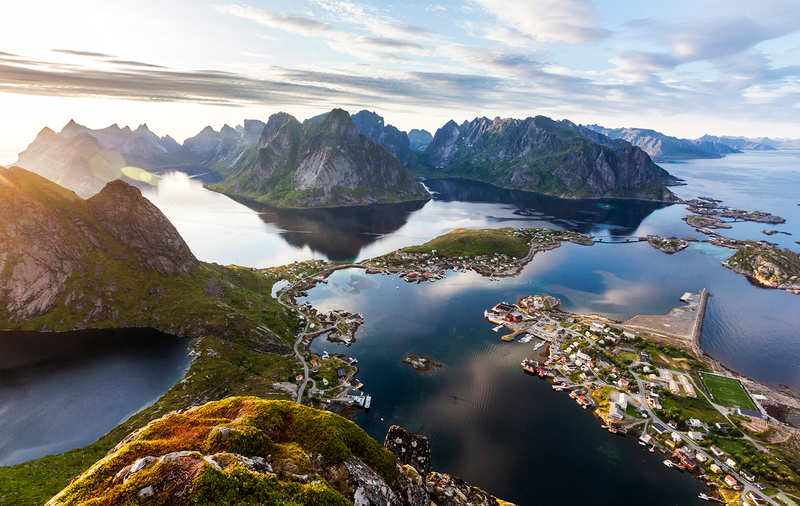 I've been to Italy seven times, the first time as a tourist, stopping at all the museums and famous places, the second time as a traveler daring to wander off the beaten path. All these other times I've gone as a would -be Italian, seeking the people, the culture, the food, the friendships, and , of course,the wine. Many times I have had the throat-catching experience of a great, peppery olive oil. There is nothing like it, and it is even better when you stop at an Italian vineyard in a little known area and the family proudly invites you to try their other wares: their fresh olive oil, their homemade tapenade, their cheese, or their marmelata. We've learned to stay in small apartments on out=of - the way vineyards and get to know the produce and the people. NOTHING can beat it!! And the precious memory of the first peppery olive oil on the tongue, the warmth of the sun on your back, the delicious aroma of a great cheese, and the myriad 'salutes' as you raise your glass of wine with the locals remains forever. Wow, it certainly sounds like you really immersed yourself into the culture my friend! I love just to have experiences like that and even more, I love to read about others' such as yours as well. Your comment paints a picture of a perfectly sublime experience under the Tuscan sun! Thank you so much for sharing your wonderful journey with us!! Nowhere can I find a price. How much will it cost me to order? The pricing has been removed since ordering is now closed until August. Keep checking via the link above to the Convivium for more ordering information. Thanks so much for stopping by! Hello, I was wondering around much would it be to purchase a case, I know ordering is not in season right now so an approximate price would be nice! Thank you! Hi there Emi. Cases run approx $300 but if you split it among friends, it's a lot cheaper! Once you taste this oil, you'll never buy store products again! I guarantee it!